I got this recipe from my cousin, Rachele when I was looking for a yummy soup recipe! I had a feeling my kids nor Joe would like it (and I was right) BUT I LOVED it! Lentils are something my Mom and Nana used to make often and something I always looked forward to eating. I’ve also made them before for my family and my girls used to eat them….but not like this, because of the spinach. It was OK..more for me! 🙂 This recipe was very good and I highly recommend it! I like my lentils a little more on the mushy side so I cooked them awhile longer than the recipe told me to! 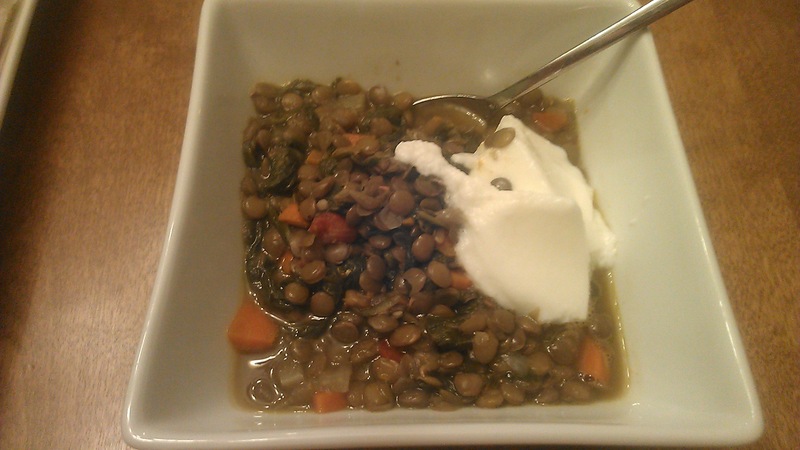 I also like my lentils with grated parmesan cheese……the recipe and my cousin called for a dollop of plain yogurt. I tried it both ways, but liked the cheese better! OBVIOUSLY! Peel and slice and garlic. Heat oil in a large pot on medium heat. Add all vegetables and garlic to pot. Cook until vegetables are soft, but not mushy. Peel and finely slice the ginger. Add broth to pan with lentils, ginger and tomatoes, salt and pepper. Bring to a boil. 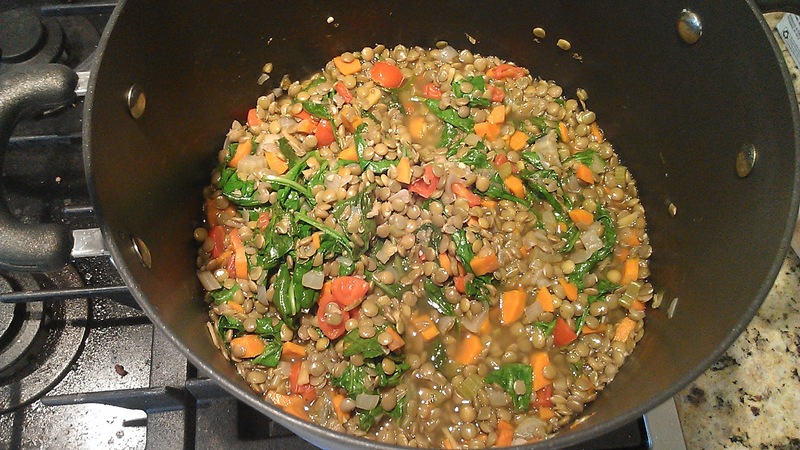 Reduce the heat and simmer (with the lid on), until the lentils are cooked…approx 20 minutes. Add spinach and cook for another minute or two. Top with a dollop of plain yogurt or sprinkle some grated parmesan cheese (YUM). I was recently in charge of making cupcakes for Olivia’s teacher’s birthday. I asked around to other teachers and my Mother-in-Law who is a newly retired teacher from our district to find out what her favorite dessert/sweet is and no one could give me an answer, but I knew she liked chocolate. 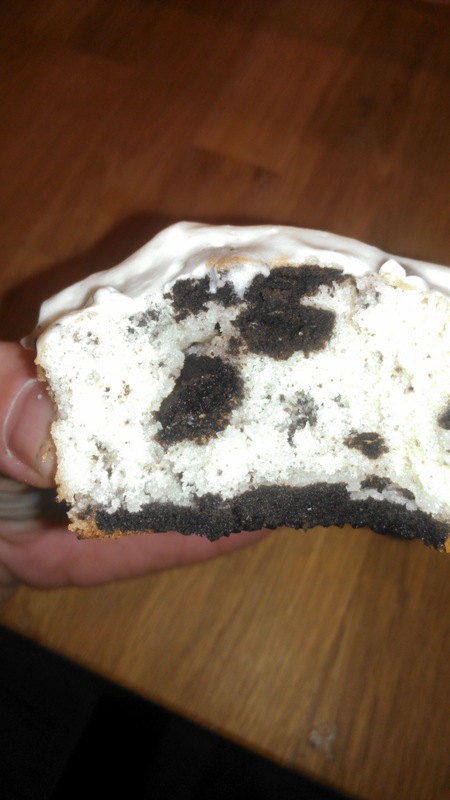 Soooooo I found a recipe for Cookie N Cream Cupcakes and decided to give them a shot. I gathered my little bakers and my ingredients into the kitchen and we got started right away. The recipe came from Annie’s Eats who has so many delicious recipes of all kinds……AND I figured out where I got the recipe for the Cookie Dough Cupcakes that I recently blogged out! ANNIE’S EATS is where it came from!!!! 🙂 So THANK YOU, Annie! OK so we made these cupcakes and they were delicious…Olivia’s teacher and the kids in her class LOVED them, BUT I thought they were a tiny bit dry. I’m not sure if they are a drier cupcake or if I did something wrong, but they def were drier than I like my cupcakes. The dryness DID NOT take away from the delicious taste though, I can promise you that! I’d like to give them another shot and see if they are equally as dry the next time! Line the cupcake pans with 24 paper liners. Place an Oreo halve in the bottom of each liner, cream side up. In a medium bowl, combine the flour, baking powder and salt; stir together with a fork to blend and set aside. In the bowl of an electric mixer, combine the butter and sugar and beat together on medium-high speed until light and fluffy, about 2 minutes. Blend in the egg whites one at a time, beating well after each addition. Blend in the vanilla extract. With the mixer on low speed, beat in half of the dry ingredients just until incorporated. Add the milk and beat just until combined, then mix in the remaining dry ingredients. Gently fold in the chopped Oreos with a rubber spatula until evenly incorporated, being careful not to over-mixEvenly divide the batter between the prepared cupcake liners. Bake for 18-20 minutes, rotating the pans halfway through baking, until a toothpick inserted in the center comes out clean. Allow to cool in the pans 5-10 minutes, then transfer to a wire rack to cool completely. To make the frosting, combine the cream cheese and butter in the bowl of an electric mixer and beat on medium-high speed until smooth, about 1 minute. Beat in the confectioners sugar until incorporated and smooth, 1-2 minutes. Add the heavy cream to the bowl and beat on medium-low speed just until incorporated, then increase the speed to medium-high and whip for 4 minutes until light and fluffy, scraping down the sides of the bowl as needed. Frost the cooled cupcakes as desired. 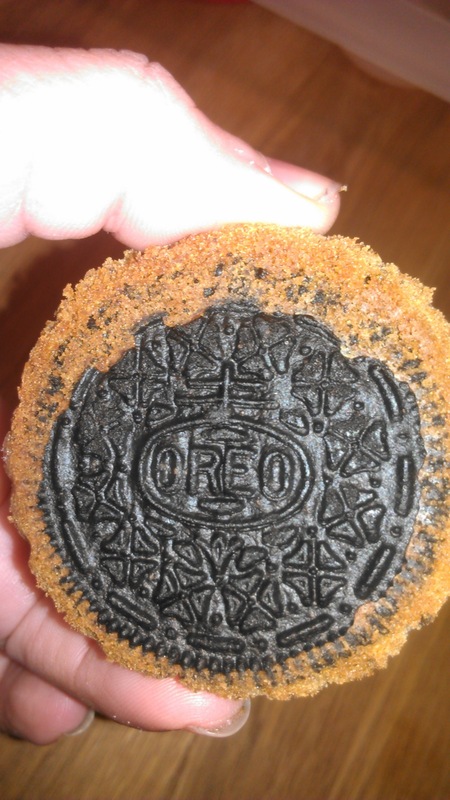 Garnish with leftover Oreo halves. I have been dying to try Tilapia, it’s something I had never had before (GASP!) simply because I never found a recipe I liked! Until I ventured over to my friend, Kelly’s website and found one that sounded really delicious! My parents had just gotten home from a 14 day cruise (so jealous) and my Mom hadn’t done food shopping yet, so I invited them over for dinner. 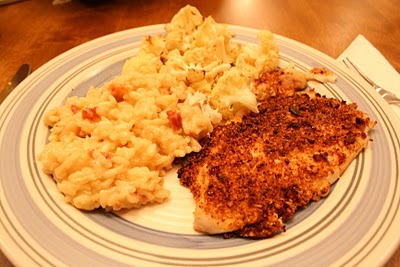 I decided to pair the tilapia with Kelly’s Sundried Tomato Risotto and the Roasted Cauliflower. And this meal did not disappoint! As everyone knows I am always looking for recipes that my kids and husband will eat (I pretty much eat everything — well……..except bananas, tuna fish, chocolate, yellow mustard and of course I limit my red meat), and this was a hit! In a food processor add sundried tomatoes, pine nuts, cheese and basil and pulse until mixed well and very finely chopped. Rinse fish and pat dry with paper towels. Place on a baking sheet that has been sprayed generously with cooking spray. Put under the broiler for 3 minutes and then remove. Flip filets over and sprinkle generously with the mixture…making sure you coat the whole thing. Put back under the broiler for an additional 3-4 minutes. KEEP THE OVEN DOOR OPEN and keep an eye on this…because it cooks very quickly. 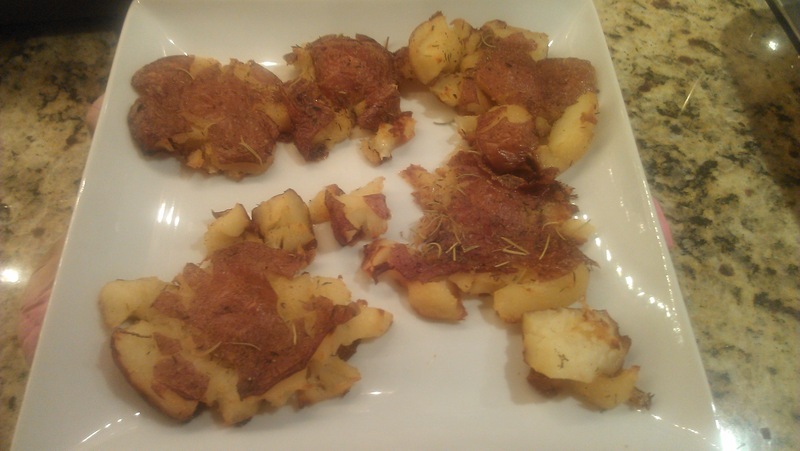 Here is a very simple way to make potatoes! Another Pinterest recipe that I’ve added to my usual recipes that I make often, and that we all like! It’s also great because you can add any seasoning to them……garlic, onion, old bay, ranch seasoning, italian seasoning….the possibilities are endless! And you can top them with any kind of garnish…..bacon, cheese, chives…again..use your imagination! 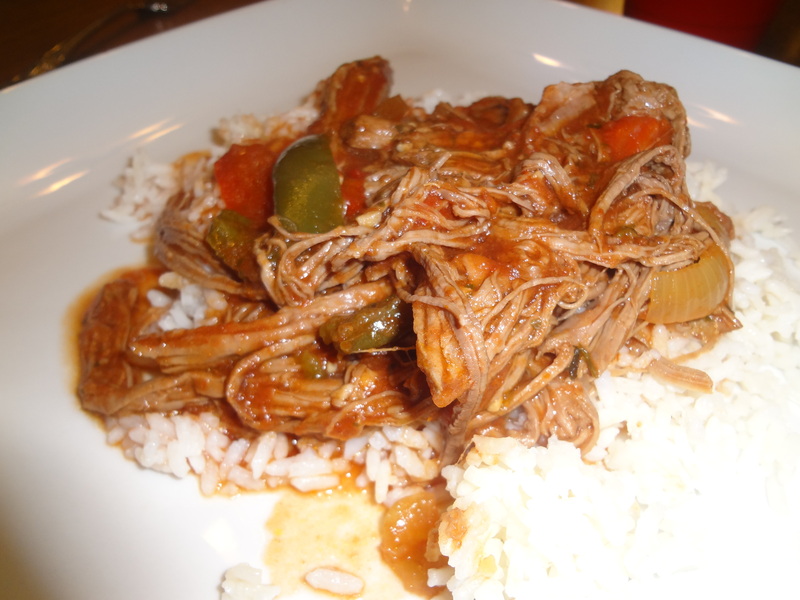 Simple, delicious and customized to how you like it…..all equal a winning recipe in my book! I think you’ll agree when you try these little potatoes out! Garnish — have fun with it! Place potatoes on cookie sheet and using the bottom of a cup, gently smash the potato until flat. Drizzle with olive oil and season with whatever spices you’d like. Place in preheated oven and cook for 25-35 minutes or until nice and crispy and golden brown! One thing I really don’t do well are chocolate chip cookies……..no matter which recipe I use or how I tweak it or what I change…they never come out just right. I’ve even made friend’s recipes where the cookie was so soft and fluffy and delicious and mine are flat and brown! I’ve gotten new ingredients, used different types of cookie sheets, used a silpat, cooked for less time, cooked for more time………FLAT AND OR BROWN! I am a chocolate chip cookie failure! 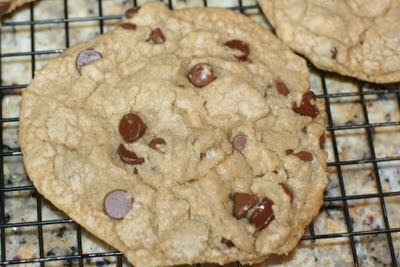 You will see as I post chocolate chip cookie recipes how randomly different they all turn out, but they are never soft, chewy and light…..sometimes flat, sometimes brown and flat, sometimes big and brown…you get the idea! They always taste great..sometimes amazing, but they don’t look it! If anyone has any other tips or can explain what I’m doing wrong….please comment! I’ll try anything! 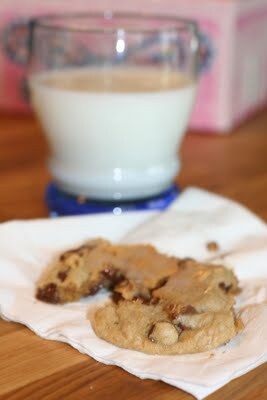 So here is one of my MANY chocolate chip cookie recipes…that landed me with some HUGE, FLAT, (BUT DELICIOUS) cookies! This is probably my favorite recipe I have for chocolate chip cookies….they are the softest and chewiest, but the flattest! 1 cup butter (unsalted) melted and cooled. Preheat the oven to 325°F . I used silpats on my cookie sheets this time! If you don’t have them….I highly recommend them for baking cookies! In a medium bowl, cream together the melted butter, brown sugar and white sugar until well blended. Beat in the vanilla, egg, and egg yolk until light and creamy. Mix in the sifted ingredients until blended. Stir in the chocolate chips by hand using a wooden spoon. Bake for 15 to 17 minutes in the preheated oven, or until the edges are lightly golden. Cool on baking sheets for a few minute and then transfer to wire racks to cool completely. Makes 12-14 BIG cookies. ENJOY!!!! I know we did!!! I like to eat my chocolate chip cookies with peanut butter on them….or dipped right into the peanut butter jar. And of course with a glass of milk! I normally wouldn’t do back to back recipes (shrimp/shrimp)…..but this deserved to be posted RIGHT NOW. We don’t eat shrimp back to back either! So last week my best friend and I had one of our girl’s night dinners….just her and I! We try to do it a few times a month because even though we talk on the phone multiple times a day…(normal, right?) when dodgeball isn’t in season we don’t see each other often enough! Thankfully dodgeball starts again next week and I get to see her once a week for the next few months…..YAY!!! Anyway……enough about her…let’s move on…..
We decided on a local restaurant that we’ve been to before, but really like the atmosphere! For the locals…Urban Table in Morristown…..PLUGGIN IT! It’s great food, great atmosphere, and the prices aren’t crazy! We had already decided on what we were getting…..cheesesteak spring rolls and a grilled chicken chopped salad to share……ooooor so we thought!!! The waiter came over and read the specials and he barely uttered the entire list when Nil (BFFs name) and I looked over at each other and just knew…..HE IS HOT!!!! Nooo,.just kidding……..MEAL CHANGE! We were forgoing the salad….natch….and ordering up the Blackened Shrimp Po Boy with the Cheesesteak Spring Rolls! We deserved it after a 12 day plank challenge we had just about finished anyway! The second our meal arrived…..and we laid eyes on the Po Boy……we just knew! And (Po) Boy, were we right! It was one of the most delicious things I had eaten in a long time! I was really upset we decided to share…I wanted it all to myself!!! Especially knowing I couldn’t just go back another day for it….because it was a special! 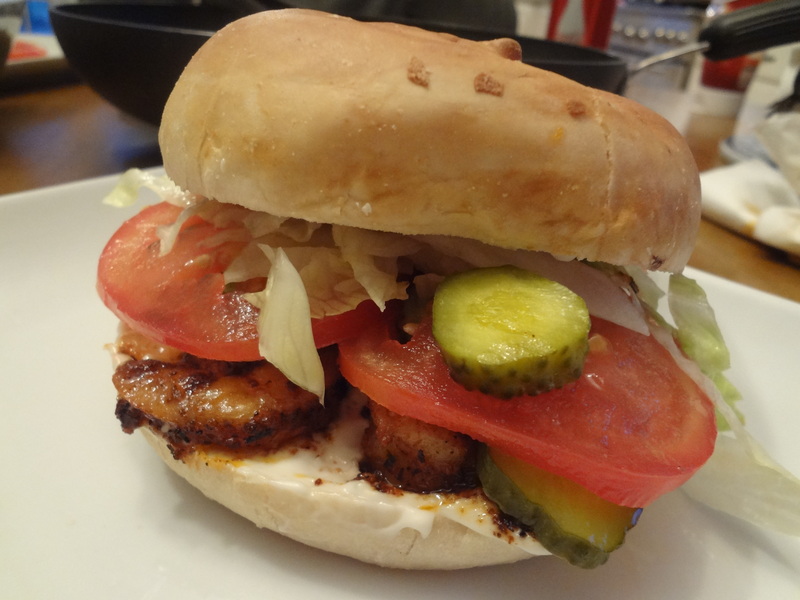 The combo of blackened shrimp and the pretzel bread….YUM…add in some pickles and lettuce and tomato….YUMMMMMMY! So I decide I would be making my own very soon…and here I am less than a week later…recreating this sandwich. And I get the whole thing to myself!!!!!! Love ya, Nil….but mine…all mine! 🙂 Super easy, Super delicious!!! MUST. TRY. SOON!!! Clean peel & devein shrimp. Place in large ziplock with enough seasoning to coat all shrimp. Place in fridge for about 30 minutes – 1 hour. Shred lettuce, slice pickles, slice tomato, prepare rolls (just scoop some of the inside of the roll out to make a nice hole). Melt butter in large skillet. Place shrimp in single layer and cook about 4 minutes, flip and cook another 3-4 minutes. Remove from heat. 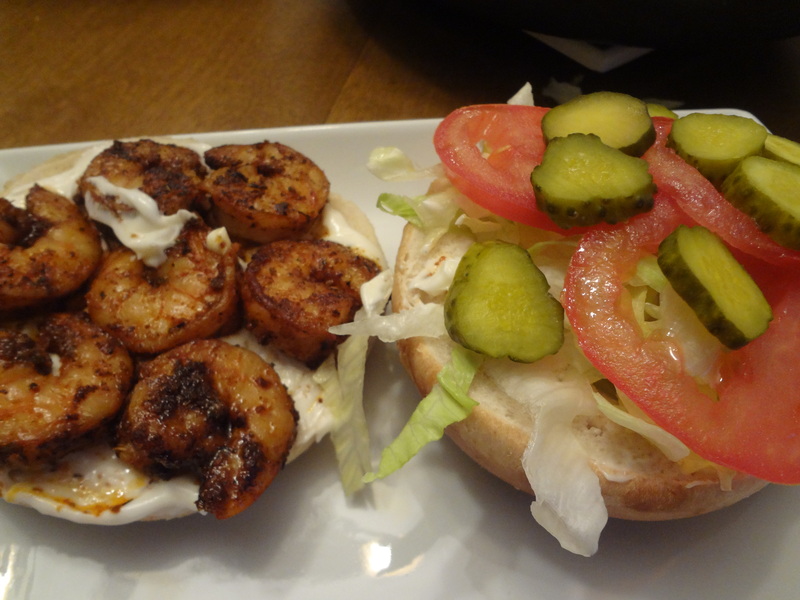 Mayo on roll, shredded lettuce, tomato and pickles on one side…..mayo and shrimp on the other. Bring both sides together and ENJOY..I know you will!!!!! I stumbled upon this recipe on Pinterest when I was looking for a new shrimp recipe. This one sounded perfect and something that I knew the whole family would enjoy! 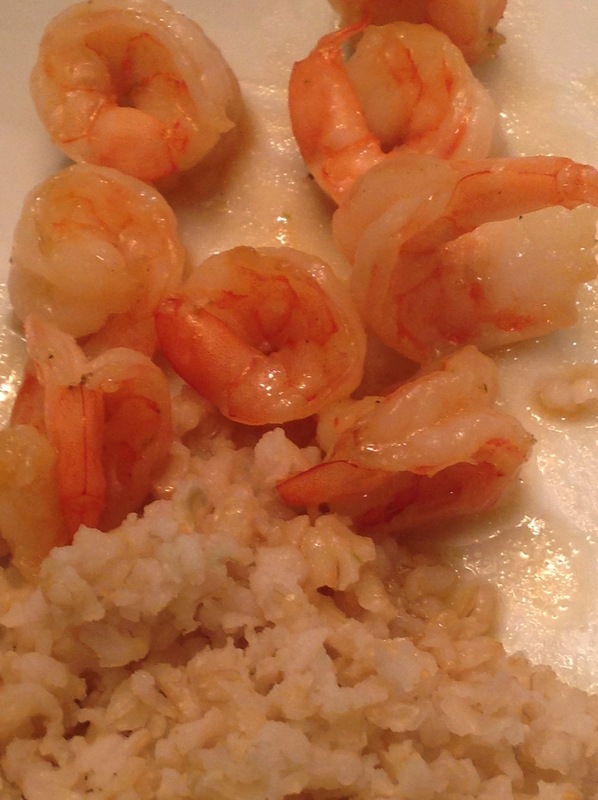 We love shrimp in our house and cook it a lo,t so finding new recipes is always fun! This recipe is a perfect combo of sweet and savory…with a bit of a kick. Use the red pepper flakes to your liking. 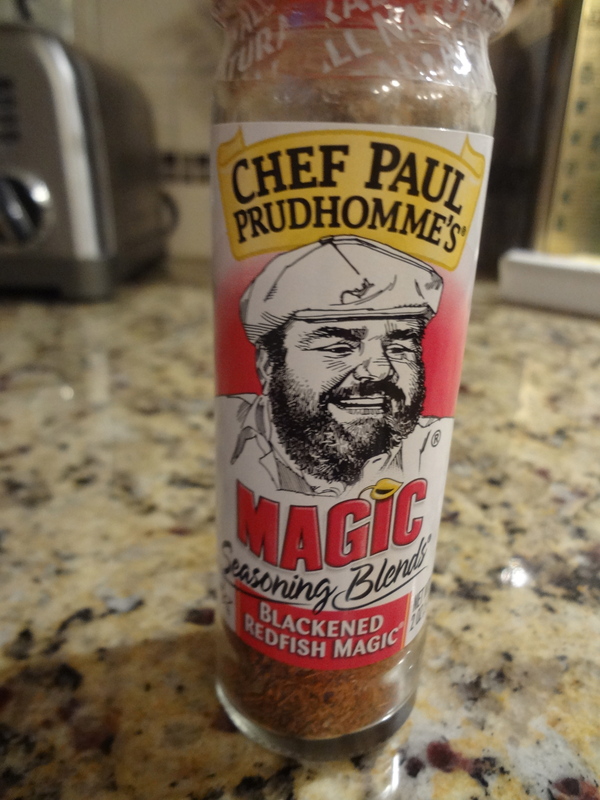 My kids don’t love too much spice, so I didn’t use much….but if you like spice, add more! I served it with rice and salad and it was amazing! The shrimp get a little crunch to them too, which makes the flavor almost explode in your mouth! YUM! Combine all the ingredients in a ziplock bag. Put in fridge and marinate for 30-60 minutes. Toss in bag a few times to get them well coated. Remove from fridge approx 10 minutes prior to cooking. 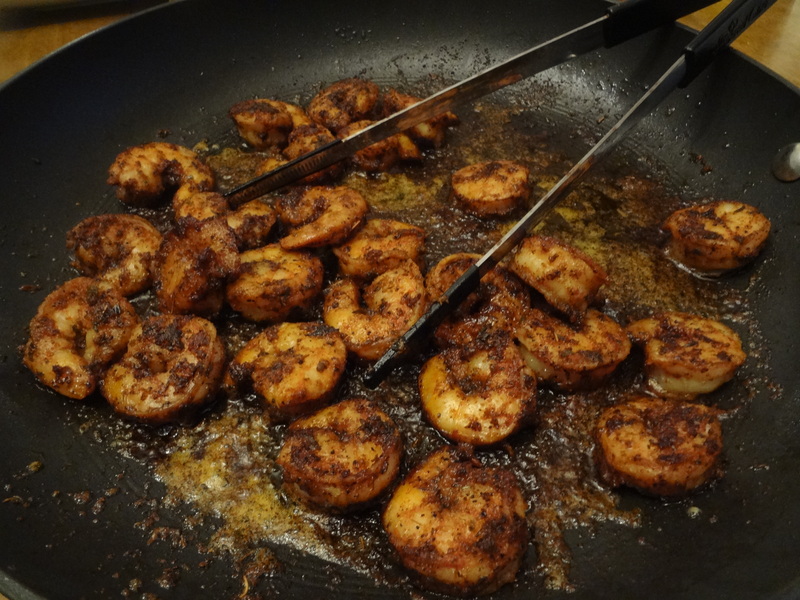 Add your shrimp to the pan in a single layer, making sure they are not too crowded; you can always cook them in more than one batch. Let them cook on one side for about a minute, until they curl up and start to turn pink. Flip them over, and cook for another 30 seconds or so, until the shrimp are opaque. Remove from the pan, and serve immediately over rice! 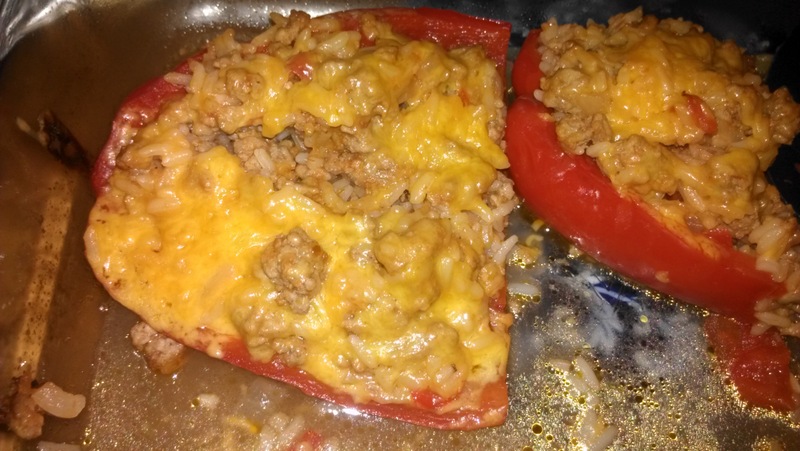 Stuffed peppers are one of my most favorite foods. It has every component for a complete meal too and uses ingredients I always have on hand! My family doesn’t love them as much as I do…but they will eat them. The girls like the filling, so it works! They are very, very simple and so delicious. I LOVE red peppers and don’t love green….so I usually opt for the red, but will use green too. It’s really just a personal preference! 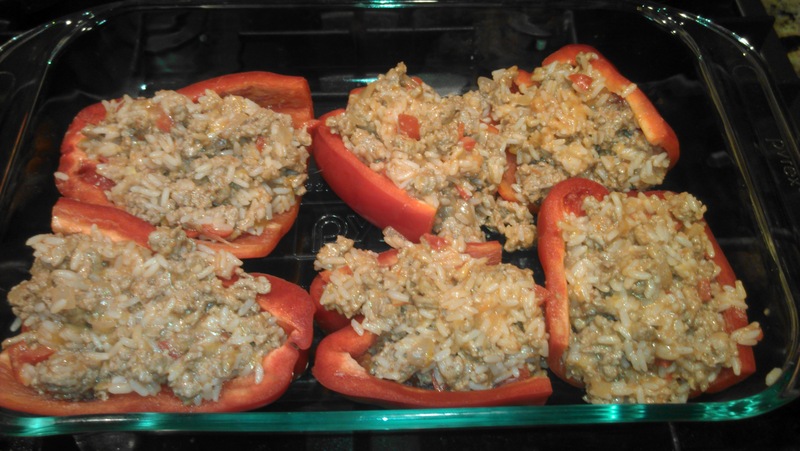 This is one recipe, I have other recipes too for stuffed peppers….stay tuned for more! Shredded Cheese — I used cheddar but you can use anything. In a large pan heat oil and add garlic. Cook for 30 seconds. Add onion and cook until translucent. Add turkey and cook until browned. Add drained can of tomoatoes and cook for about 5 minutes. Add tomato sauce and cook for about 5 minutes. Remove from heat and add to the mixture. Add handful of cheese and mix well. Stuff the peppers with mixture. You can either half the peppers (like I did this time) or keep them whole and standing in the pan. 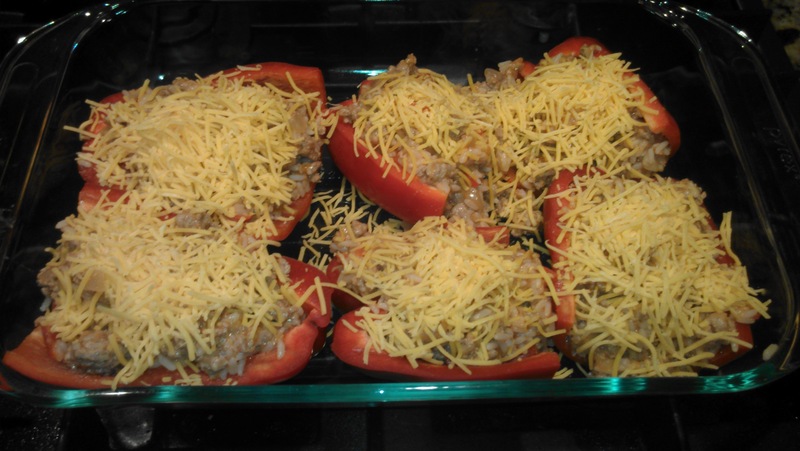 Top the peppers with a little more cheese and breadcrumbs. Cook for 30 minutes at 400 degrees. 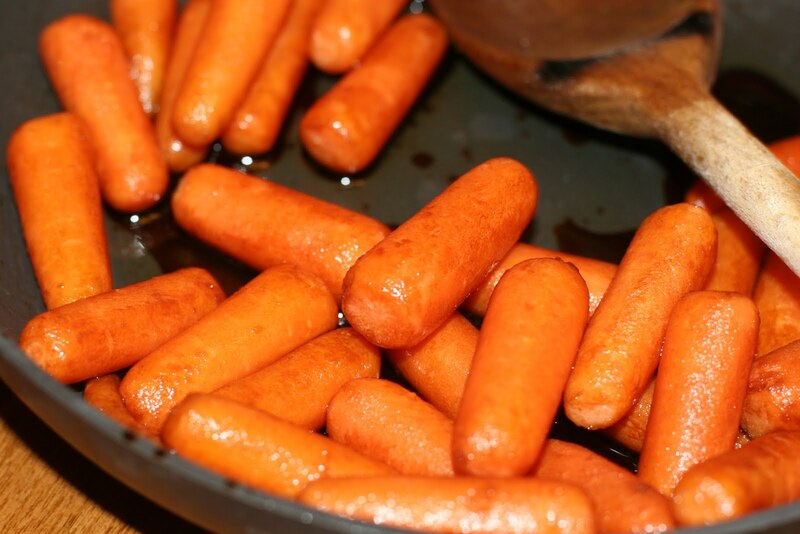 An old faithful…..this recipe is one I have made many times….many, many times because baby carrots are something I always have on hand! So it’s such an easy side dish to make….my girls and I LOVE them…Joe on the other hand does not. As I’ve said before, Joe’s “allergic” to carrots……I think it’s a mental allergy, but he promises it’s real! This recipe works perfect as a side dish to really anything! It’s super simple, uses very little ingredients and takes hardly any time! Heat oil in a skillet over medium-high heat. Sauté carrots in oil for about 10 minutes, or until tender. Stir in balsamic vinegar and brown sugar, mix to coat and serve.